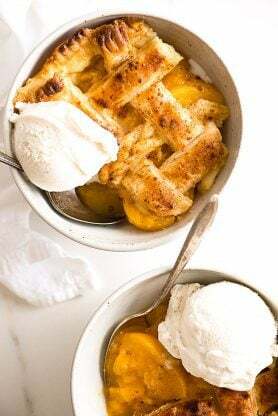 Southern Peach Cobbler Recipe (How to Make Peach Cobbler) – This Easy peach cobbler with canned peaches or fresh peaches is the perfect Southern old fashioned recipe made with sweet spiced peaches and homemade butter pie crust. Peach cobbler is my all time favorite dessert, and big mama’s are masterpieces. She loved to surprise me with one whenever I visited, and I sometimes surprised myself with how much I could eat in one sitting. The moment I first tasted peach cobbler is a moment etched in my memory that I can’t seem to ever forget. Just imagine ripe peaches, zests and syrupy sweetness bubbling beneath the delicate lattice of a buttery and flaky pastry. It simply can’t get any better. 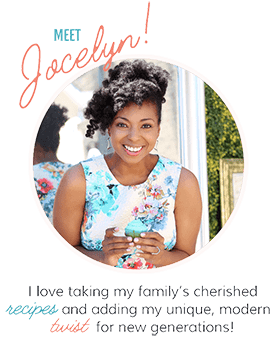 I’ve shared so many peach recipes on this website like these peach crumb bars and even this fresh peach pie but it was time I share my absolute favorite recipe known to man. And boy oh boy is this a keeper. This is the classic done right and done the old fashioned way. Southern peach cobbler can’t get any better than this. Though I have made peach cobbler more times than I can count, it really doesn’t require more than a few ingredients. To start, you begin with the peaches which can either be fresh, frozen or canned. I will give you more details below but you can really select anything you prefer here. The peaches will need additional ingredients to create a lovely syrup. This is what really makes the difference between this being a pie and a southern cobbler. The additional juices really take it to another level. The filling ingredients below develop on your stove top and thicken to create a substantial syrup to drown those peaches in. For the crust, things can get a bit more complicated. I have seen everything from a biscuit topping to crumble topping or in my version pie crust. Most soul food peach cobblers will have a pie topping. I have tried them all, and this is my absolute favorite. The pie topping is what truly makes it authentic and southern in my opinion. The lattice crust is essential as well though you can have fun with this and modernize it. 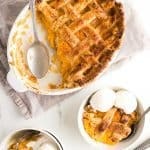 How is this Easy Peach Cobbler? I know for a lot of people, making a homemade peach cobbler seems quite intimidating but this one shouldn’t. Though this does involve a lot more steps than usual, there are ways you can make this easier. 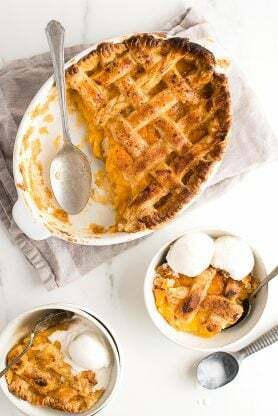 First this recipe starts with canned peaches, which I discuss a bit more about below, and also you can sub a premade refrigerated pie crust if you really run out of time or don’t want to tackle the homemade version below. Cutting corners will also help you cut the time on this recipe as well. Now don’t frown at canned peaches being used in this recipe. My mama made peach cobbler year round with canned peaches so we could taste this deliciousness anytime we wanted. If you want, you can purchase organic canned peaches. I personally like to use canned peaches in a light syrup so I can develop my own syrup. I drain most of the syrup from all of the cans except for one and add additional liquid through melted butter. It gives the peaches that buttery flavor without making too much sauce. If you want to go the fresh peach route, you can do that as well. I certainly love to use fresh peaches in the summertime as soon as they are in season. In the midwest, peach season begins around July and August so that’s the best time to grab them for this recipe. However I hate using peaches when they aren’t in season. It just isn’t the same. For the equivalent you will need about 3 3/4 cups of peach slices. You will need to add more butter and sugar and lessen the amount of flour to create more syrup when using fresh peaches. You won’t be starting with the light syrup from the canned peaches so you will need to adjust for this. Make sure you taste the syrup and get it to the thickness and sweetness you prefer when making this adjustment. What else is needed for Southern Peach Cobbler? To develop sweet spiced peaches and syrup, I also add granulated sugar instead of brown sugar. I find that adding brown sugar gives a little too much strong flavor with the addition of molasses. Additional spices such as cinnamon and nutmeg are also added to the bunch. I don’t add as much cinnamon to my recipe because I believe nutmeg is the major spice for peach cobbler. My big mama and mama don’t really ever add cinnamon to their peaches but I find a hint really helps spice it up just a bit. A full tablespoon of pure vanilla extract rounds out the filling. Make sure you use real vanilla extract and not imitation. You can truly taste the difference. If you really want to up the anty on vanilla, try vanilla bean paste. When the peaches are done and the syrup is developed, I like to allow them to cool a bit to thicken. Now you will have to play it by ear to decide how much syrup you add to your peach cobbler. The more you add, the saucier it will be though some will thicken more and more in the oven as it bakes. However you want to add as much as possible so it will have a nice syrup left once it cools. I use pretty much all of mine sometimes and then maybe leave ¼ in the pot other times depending on how I’m feeling. Finally I go with a perfect pie crust recipe made with all butter. I have a wonderful tutorial on how to make this here. It is important that you keep all of your ingredients very cold when making this so it comes out exactly like you want it to. An egg wash topped with ground cinnamon is the final Southern touch to make your peach cobbler as authentic as possible. The egg wash will ensure you have a golden brown crust. The end results are perfection. This is the peach cobbler that will impress all of your friends. 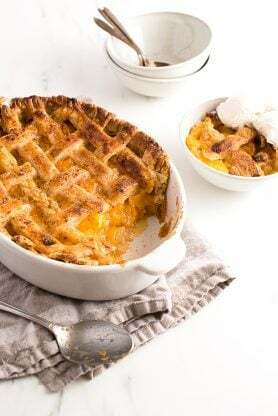 Southern Peach Cobbler Recipe (How to Make Peach Cobbler) - This Easy peach cobbler with canned peaches or fresh peaches is the perfect Southern old fashioned recipe made with sweet spiced peaches and homemade butter pie crust. 1 egg beaten with 1 teaspoon of water. Drain two of the cans of peaches and add just peaches to a large pot. Add the remaining can of peaches with lite syrup along with butter to a large pot over medium heat and allow everything to melt together. Once butter completely melts, stir in sugar, cinnamon, nutmeg, and vanilla and allow peaches to come to a boil. Once boiling, remove 3 tablespoons of peach syrup from large pot and place in a small bowl. Whisk flour into small bowl of peach syrup until completely combined creating a slurry then stir into the pot of peaches. 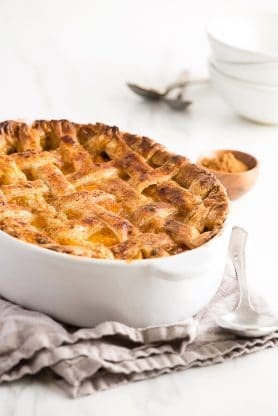 Cook an additional 30-40 minutes or until syrup thickens and coats the back of a spoon then remove from heat and allow to cool down and further thicken while you make pie crust. Slowly add the cold water into the flour until a ball of dough forms. Start with ½ cup and add more water if you need it. Knead the dough quickly to bring it together. Don't worry if there is any flour left in the bowl. Remove the dough from the bowl, cut into 2 sections and round into balls. Cover each ball tightly with plastic wrap and place in the refrigerator for 35-45 minutes to rest. Remove dough from fridge and add a bit of flour to a working surface or clean counter and place dough on it. Unwrap one ball of dough. Using a rolling pin, quickly roll dough out to about ⅓ inch thickness and place on the bottom and up sides of a 9x13 inch baking pan. Using a slotted spoon, remove just the peaches from the pot and spoon on top of dough. Next pour the remaining syrup to the peaches (if you like less syrup you can use less. Totally up to you but I wouldn’t use less than 2/3s since it will continue to thicken when baked). Roll out the final dough ball and decorate the top of the peach cobbler how you see fit with the dough. Brush the top of the dough with egg wash then sprinkle slightly with ground cinnamon. Bake for 40-45 minutes or until crust is beautifully golden brown. Cool down and serve. Thank you for sharing this! I made one for Thanksgiving and my oldest asked me to make a pan for Christmas. My kids Love it! It’s just like the peach cobbler my MIL used to make! It’s delicious!! That makes me so so happy. YES! you got this right! Tired of seeing recipes for cobbler with fat doughy biscuits on the top. In Alabama, This is how a cobbler is done. Made my mouth water. The first time I ever ate cobbler was at a diner in a little town in Southern Illinois, and it was made with pie crust. It was love at first bite. That’s still how I prefer fruit cobblers, so I’ll be trying this soon. Years ago I saw a recipe from Loretta Lynn in a promotional cookbook, and she used three layers of pie crust with each of the baked for a while before the next layer was added. There was crust on the bottom that was baked, then a layer of fruit filling, another layer of crust that was baked and more filling with a crust on top. It’s a wonderful version that’s I’ve made any number of times. I have to say you have one of the cutest babies I’ve ever seen. I love your photos of her. OMG I love the idea of baking the layers of pie crust. So interesting and I might just try that!!! Also you are so so kind. Thank you so much for the sweet compliment about Baby Cakes! I absolutely love fresh peach cobbler and your recipe is very similar to my grandmas. The only difference is she added dumplings. Do you have a recipe for adding dumplings?Oh and by the way your little “Baby Cakes”is cute as a button! Hi Marilyn, thank you for the sweet sweet comment. I actually don’t for the dumplings. We never used to make it that way I’m afraid. I’m sure it is so delicious that way too! I learned to make peach cobbler from my mom with a recipe similar to this. I put white & brown sugar in my filling. We don’t make a bottom crust ,instead we use that dough to make dumplings that we drop into the filling while it is cooking. Then we just put on the top crust. I like cinnamon, nutmeg & allspice as my spices in my cobbler. Oh I love how much peach cobbler is a part of people’s hearts. I love the way you make it. I bet it tastes amazing. Pretty sure this has to happen at my house asap! Yes indeed it does boo. Peach Cobbler is my all time favourite dessert! Doing a wonderfull job. Thanks for the share. Hooray it is definitely an all time favorite of mine too! This is one stunning peach cobbler! I love the charming topping! I am in heaven! This looks fantastic! I love to try this!! Perfect summer treat! I use canned peaches too and sometimes add a fresh mango too. Usually go the Texas way of not making a crust but the old self rising flour, sugar and fresh buttermilk , melt a stick of butter in the pan, add the batter then the fruit mixed with spices on top and bake. But definitely will try yours out soon. 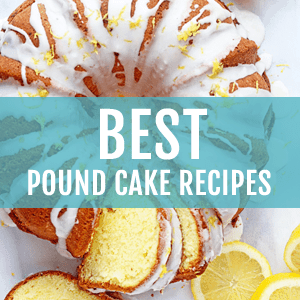 I love your recipes and want to try out your yellow cake or gold cake sometime . Thank you for sharing! Love you. OH I love the idea of the fresh mango being added. Genius!!! Can’t wait to hear your thoughts on the yellow cake. 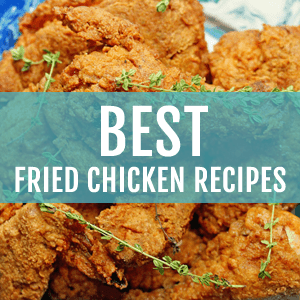 Your Texas way seems more like what I had as a child…what is your recipe measurements if you do not mind sharing. I tried Grandbaby Cakes way and it is great, I just like other options. This peach cobbler looks incredible! I love the top crust! I love having the option of using canned peaches! Now we can (haha) enjoy this all year round!! Absolutely!! That’s my favorite part of this recipe. The kids absolutely love these. You did a wonderful job on this! I love Peach Cobbler! It is the perfect summer dessert! I should’ve made that yesterday! Thanks for sharing another great recipe dear! Hooray I love it too. It is seriously my favorite thing ever. And thank you doll!